Monkey Puzzle / Where's My Mom? When the little monkey can’t find his mother, a kind butterfly offers to help. Little monkey describes his mother in the hopes that the butterfly will find her. “She’s big! Bigger than me,” says little monkey, but the butterfly leads him to… an elephant. “Her tail coils around trees,” says little monkey, but the butterfly takes him to… a snake. The well-meaning butterfly keeps misunderstanding the monkey’s descriptions and they meet many different jungle animals until, eventually, they find little monkey’s family. 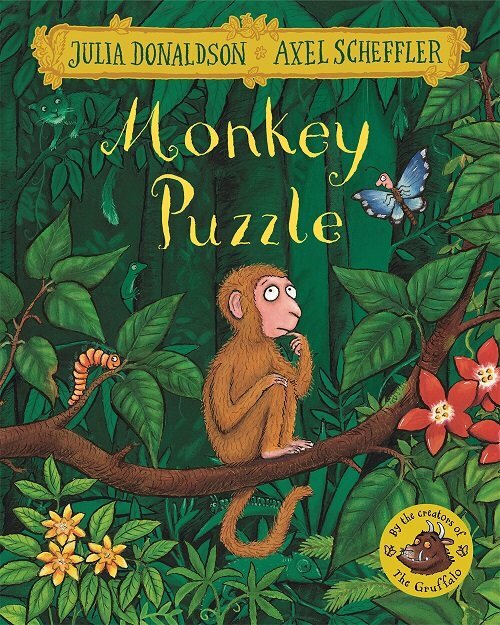 Monkey Puzzle is a humorous story written in Julia Donaldson’s signature rhyming style. It is a fun read-aloud that provides children with lots of opportunities to interact with the story; such as labelling the animals and predicting which jungle animal the little monkey will meet next. The story contains fantastic descriptive language, so it’s an ideal option for targeting children’s describing skills. Kids will enjoy coming up with their own descriptions of the animals and having a go at giving their best description of the little monkey’s mother. For further speech and language targets in Monkey Puzzle or Where’s My Mom? (USA) by Julia Donaldson, see the list below.